Please sign & share the petition to Save our Native Wild Horses! Taxpayers are paying for cruel native wild horse roundups in the West–where Big Oil wants to Frack for oil and natural gas–and needs water to do so. A lot of natural gas will be sold to Asia, to make electricity. During and after roundups many wild horses are injured: foals are often killed and many mares miscarry their babies. Currently 50,000 native wild horses are stockpiled in holding, at-risk of going to slaughter, and should be returned to live on public land. Less than 18,000 indigenous wild horses are estimated to be living in freedom now. The National Academy of Sciences reported there is “No Evidence” of overpopulation. www.ProtectMustangs.org has called for population studies with a moratorium on roundups yet Congress is turning a deaf ear. Is the Oil and Gas Lobby influencing our democracy? Indigenous horses fill their ecological niche on public land. They help to reverse desertification, reduce risk of wildfires and create biodiversity for many species to thrive. 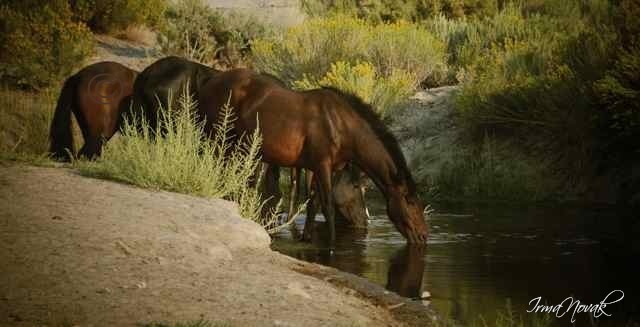 Please help protect our native wild horses before the herds are destroyed. 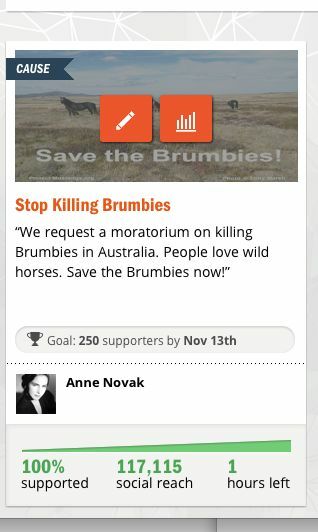 Sign & Share the Petition to Stop Killing the Brumbies! 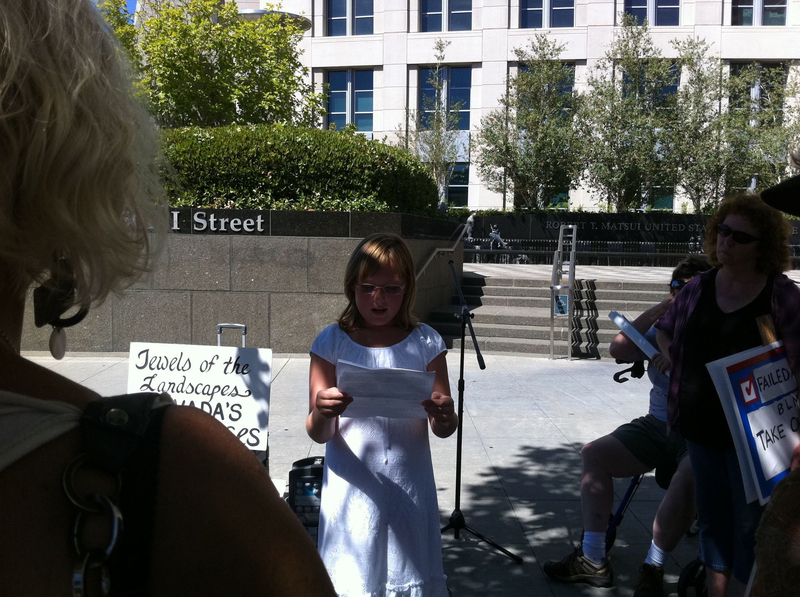 Stop the Roundups Rally, July 10, 2012, at 2 p.m. Federal Courthouse, 501 I Street, Sacramento, Ca. We got there a half hour early to meet with two other horse advocates: Debby Coffey and Garnet Pasquel. They were very nice. Garnet gave me a button and they both signed my petition. We had brought signs from Las Vegas for American Wild Horse Advocates since Garnet flew and we were driving. Everyone liked the signs we brought. After we had refreshments we went across the street to set up. A lot of people came to help and a lot of people brought signs. 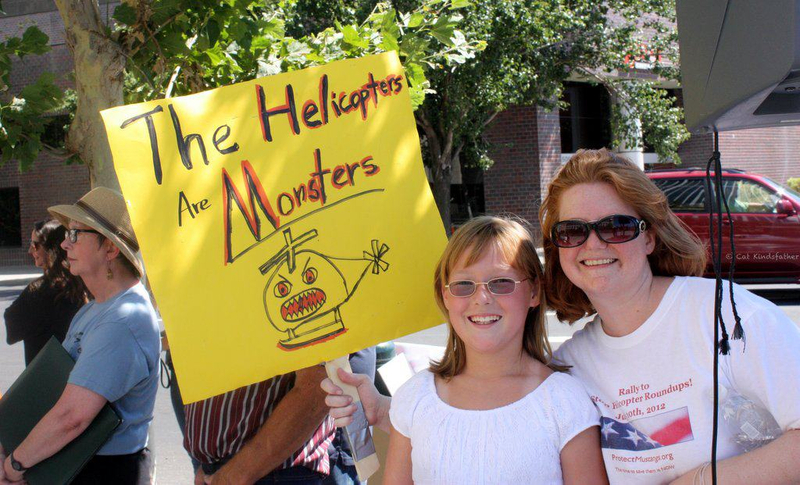 People really liked mine that said “Helicopters are Monsters”. The spectators also liked the one that said “Honk for Horses” because they kept honking. News reporters came and took pictures and video. – people from the TV and the newspaper. One reporter asked me some questions. They said they were only going to take a few pictures but once they saw all the people who came they stayed a while longer and took many more pictures. It was about 45 minutes before the master of ceremonies, Jetara True-Love, started introducing the speakers. Many great speakers spoke before me. My favorite was Craig Downer who spoke first because he had a lot of information. But it is not right for me to choose a favorite because I enjoyed every speaker. I am so grateful that wild horse hero, Anne Novak, chose me to be the Director of the Youth Campaign for Protect Mustangs. There could be no greater honor. I am so happy that this happened because I thought I would always be in the background but now I am in the front with all the rest of the horse heroes. Another member on the Board of Directors of Protect Mustangs is photographer Cat Kindfather and she is also a hero of mine. Both Anne and Cat are so encouraging to me. I’m really looking forward to letting other kids know about the wild horses & burros so they can help too. I felt like I was in Hollywood because I got to meet so many horse celebrities – my heroes. I got to close the rally with my speech. The microphone stopped working but everyone got close to hear me. When I was done, everyone was cheering for me. The rally ended but not many people left right away. We all wanted to stay and talk. Many of us stayed together after the rally until the hearing, exchanging information, and encouraging each other. Even though it was hot and a little longer than I expected I had the time of my life. And, as everyone noted, the a few hours in the heat is nothing compared to what our wild horses are put through. I will never forget this day. I hope we made a difference for the horses. I hope everyone keeps rallying everywhere until the horses are once again free!